The International Junior Science Olympiad, IJSO for short, is a competition aimed towards young talented students in the sciences. The competition is open to students up to 15 years of age. The first IJSO and the selection competition in Germany started 10 years ago. The anniversary celebration took place last weekend in Leipzig. 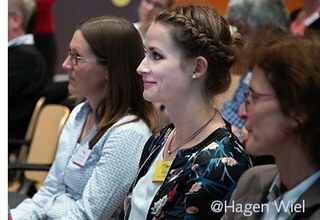 The event began with an "IJSO Class Reunion" of young people aged 15 to 25 at the Wilhelm-Ostwald-Gymnasium on Friday evening. The official ceremony with almost 200 guests on Saturday morning began with the accession of the nations. All former members of the national team, including flag bearers, entered the festival hall to the rhythmic sounds of the Samba Leipzig music group. Prof. Dr. Olaf Köller, Scientific Director of the IPN - Leibniz Institutes for Science and Mathematics Education in Kiel, opened the anniversary celebration in the Leipzig Cube. This institution is responsible for the selection procedures for six school Olympiads, including the IJSO. On behalf of the President of the Conference of the Ministers of Education and Cultural Affairs of the State of Saxony-Anhalt, Marco Tullner, Minister of Education of the State of Saxony-Anhalt, welcomed the former winners of the International Junior Science Olympiad. "It is important not to stop asking questions," Minister Tullner said quoting Albert Einstein. The answer to a well-posed question might lead to dozens of new questions. According to Tullner, this is the principle of research, of science and of progress and encouraged the alumnae and alumni of the IJSO to ask questions repeatedly and to question them anew. Participation in the selection competition has developed rapidly. More than 30,000 children and adolescents up to the age of 15 from 16 federal states have taken part in the first round of the competition over the past decade. About 5000 teachers supervised them. Almost 600 award winners and 84 national team members won prizes. These teams traveled to Indonesia, Brazil, Taiwan, South Korea, South Africa, India, Argentina and the Netherlands. In her article "Jung und forsch - die Internationale JuniorScienceOlympiade. A look back and forward", the managing director of the IJSO, PD Dr. Heide Peters, presented special and curious moments taken from Böll during the numerous federal finals and trips abroad. 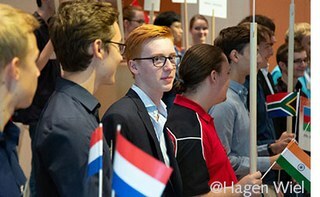 On behalf of many young faces of the prizewinners, Anne Sauermann and Florian Uellendahl reported what participation in the IJSO means to them. Finally, state representatives, long-standing supporters, sponsors and friends of the IJSO received awards. An information meeting on IJSO2020 took place in the early afternoon. In 2020, Germany will host the "17th International Junior Science Olympiad" in Frankfurt am Main. At this event, 300 young science enthusiasts from 50 nations and their 200 mentors are expected guests from December 2nd - 12th. The Federal Ministry of Education and Research has commissioned the IPN Kiel to organize the event. Support for this project comes from the Hessian Ministry of Culture.